By Scott Mobley, Naval Institute Press, Annapolis, MD. (2017). 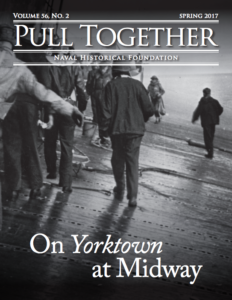 This book is part of a series edited by historians Chris Bell and Jim Bradford published by the Naval Institute. It is a worthy volume that might not otherwise have been published if not for subvention by private individuals listed at the beginning of the book. We should certainly be thankful for all concerned that they have made this former dissertation by retired US Navy Captain Scott Mobley available to us in such a handsome package. 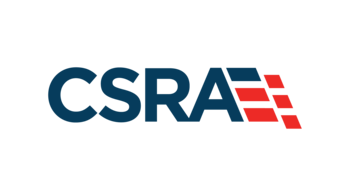 As sharp dividing line may be drawn between the military and the technical or engineering arts…yet in the ordinary exercise of the naval profession under the conditions of service, this dividing line is blurred. In…the duties of a naval officer, his military and his technical work are so closely connected, that it is hard to tell where one begins and the other ends (11). Mobley’s introduction of this framework, and how the two groups emerged and clarified their thinking after the naval de-mobilization of the fleet in 1866 is the heart of the book. The mechanists are introduced first (chapter 2) as a response to decline of the relevance of a “quarterdeck culture” (chapter 1) in the face of immense technological developments as a result of the industrial revolution. Modernization to them meant modernizing warships in order to be able to compete, if not challenge, the trend of naval developments abroad, particularly in Great Britain and France. Or put more simply, the diffusion of more and more reliable steam and motive propulsion and the Whitehead torpedo as disruptive technologies could not be ignored by any serious naval professional who might consider himself vested in the maritime security of the United States and its interests. Also included in the book are wonderful portraits of some personalities that are lesser known or have been simple caricatures in the past. First and foremost is that of the “infamous” bête noire of A.T. Mahan: Francis Ramsay. The Ramsay portrayed here is a progressive of the mechanist ilk (216, 227-228). Mobley does a good job in offering an apologia for this man, whose motives were more complex—and well intentioned—than they have often been portrayed because of his animosity, or supposed animosity, toward the saintly Mahan. Another often ignored personality who jumps out to anyone researching this period is Caspar F. Goodrich, who at first blush might seem to be of the “strategist” ilk but had his foot more firmly in the “mechanist” camp (212-213, 253). Also ignored in many earlier accounts, looms the presence of Henry C. Taylor, perhaps the most progressive of the bunch, who Mobley seamlessly ties into his narrative about how individuals migrated between camps as they went from organization to organization, many of them newly formed. This aspect of the study is particularly laudable. Ever since Henry Beers’ wonderful series over 70 years ago on the organizational change in the modern Navy there has been a need for someone to relook the role organizational dynamics and innovation played during this period.1 Mobley goes a long way toward using new research and scholarship to show the interplay, and ingenuity, in organizations like the Torpedo Station, the Naval War College, the Office of Naval Intelligence (which gets practically an entire chapter 4 to itself), and quite a few others. 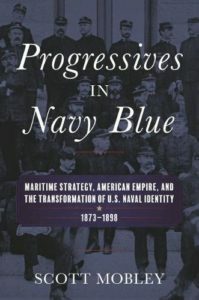 Mobley also makes an original social-cultural argument, advancing an explanation for why a traditionally conservative culture like a naval officer corps came to precede in many cases the progressive and professional movements in law, academia, medicine, and education that also became hallmarks of American history in the late 19th Century (7). His explanation is complex, and convincing—reduced to its simplest, coherent social groups with a very focused mission like maritime security, have more agility in in being socially flexible, at least to the degree manifested here where they were a bellwether of progressivism versus simply fellow travelers. One might conclude that smaller cultural collectives change more readily under the right conditions than larger ones. Finally, Mobley, like other recent naval historians such as Kate Epstein, argues that this period also saw the emergence of “a narrative of national defense rather than imperial ambition” (11).2 The idea of the incubation of what became the national security state and military industrial complex after World War II has antecedents in the new ways of thinking engendered by the naval progressive era. As to sources, this book is lovingly researched and scholars will spend almost as much time reading Mobley’s note verbiage as the actual narrative text that ends on page 270 of this 400 page book! The Naval Institute is to be congratulated on retaining that verbiage instead of culling it down. Students new to these debates over progressivism, professionalism, and reform will find much of value in the historiographical language attached to the citations. This kind of naval history, on its face, does not lend itself well to the casual reader of things naval– those folks who want some swashbuckler with a cutlass between his teeth jumping from ship to ship in the heat of some salty battle amidst Neptune’s realm. But naval warfare moved beyond that in the 19th century to a great degree, and that movement was well recognized by men like Henry Luce, Mahan, Ramsay, Fiske, and Goodrich. The trends they discerned led them to “grow up,” as it were, and abandon the culture of the quarterdeck for a more complex world of machines, organizations, planning, intellectual introspection, and strategy. Naval readers, both casual and professional, will be well served to do so, too—at least occasionally. Dr. John T. Kuehn is Professor of Military History at the U.S. Army Command and General Staff College (CGSC). He retired from the U.S. Navy 2004 at the rank of commander after 23 years, serving as a naval flight officer (NFO) flying land and carrier-based aircraft. He has taught a variety of subjects, including military history, at CGSC since 2000. He authored Agents of Innovation (2008), A Military History of Japan: From the Age of the Samurai to the 21st Century (2014), Napoleonic Warfare: The Operational Art of the Great Campaigns (2015), and co-authored Eyewitness Pacific Theater (2008) with D.M. Giangreco as well as numerous articles and editorials and was awarded a Moncado Prize from the Society for Military History in 2011. His latest book from Naval Institute Press is America’s First General Staff: A Short History of the Rise and Fall of the General Board of the Navy, 1900-1950 (Fall 2017). 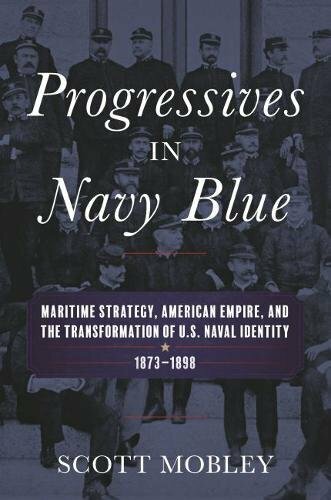 Buy Progressives in Navy Blue: Maritime Strategy, American Empire, and the Transformation of U.S. Naval Identity, 1873-1898 now! Henry P. Beers, “The Development of the Chief of Naval Operations,” Parts I-IV, in Military Affairs, Vol. 10 No.s 1 and 3, Vol. 11 No.s 2 and 4 (1946-1947). See Kate Epstein, Torpedo: Inventing the Military-Industrial Complex in the United States and Great Britain (Cambridge, MA: Harvard University Press, 2014), 3.